Situated 8 km north - east of Palekastro near the Ancient City of Itanos. It is the largest (250 hectares) oasis of palm trees in Europe, with incomparably beautiful lush greenery, thousands of palms, ending up to a pristine golden beach. 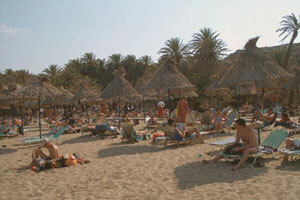 A decisive role in the making and development of this exotic oasis was semi-tropical climate of the region. The Phoenix Palm was held as a holy symbol to the Minoen Civilization at 1450 BC. The history of the palm forest has been lost through the centuries, though there are many myths and speculations of its beginnings. It was dated to the 2nd century BC. According to well established historic sources it was created from date seeds which the Egyptian soldiers lest behind as they passed by during s war in support if the ITANS against near cities. Vai has been declared both as an aesthetic palm forest and a unique biotope with rare flora and fauna. The endemic variety of Phoenix of Theophrasti palm grows naturally. The age old Phoenix Palm Trees along the beach, together with the pristine waters of the Mediterranean Sea and the close proximity of the small island, provide an exotic picture of incomparable beauty, that attracts thousands of people from all over the world to enjoy.